Consolation magazine (Trost in German), published by Jehovah’s Witnesses, informed the public about Nazi atrocities against the Witnesses and other victims. 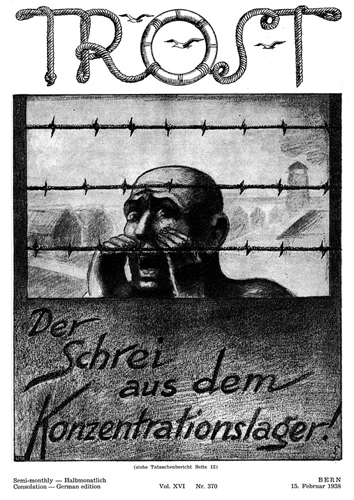 The February 15, 1938, issue was entitled “The Cry From The Concentration Camp!” This issue included diagrams of the Esterwegen and Sachsenhausen concentration camps. The magazines were distributed worldwide.